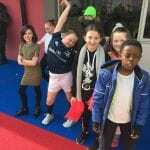 Room 15 along with Ms. Fleming went to the yard to learn about clothes. 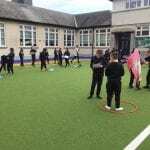 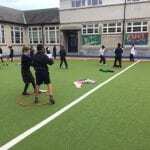 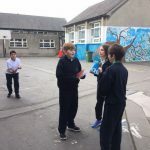 They played the game through Gaeilge and used all their new words to enjoy the activity! 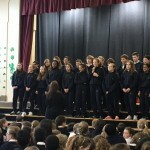 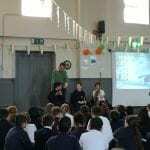 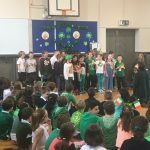 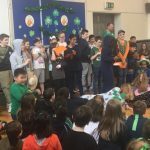 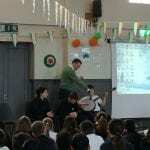 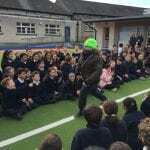 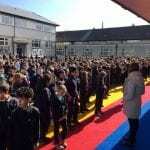 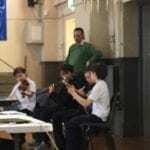 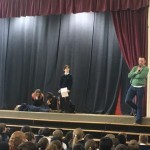 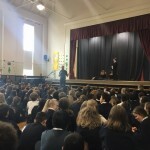 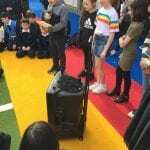 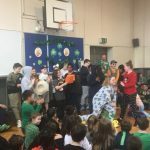 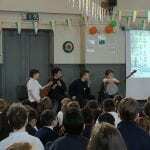 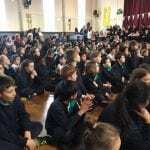 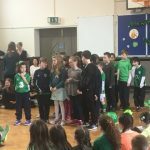 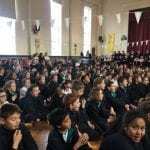 All of the pupils came together to celebrate Seachtain na Gaeilge with an assembly in Halla Cullen. 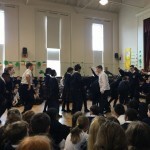 We sang songs, heard about SAt. 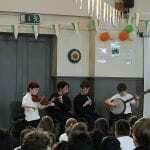 Partick, heard some wonderful traditional Irish music played by pupils and saw some Irish dancing! 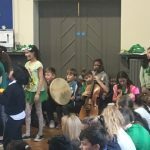 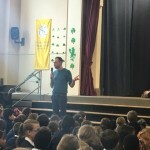 Seachtain na Gaeilge seó faisean! 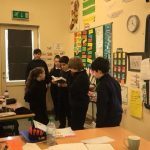 Room 15 were practicing their Gaeilge as well as their model poses. 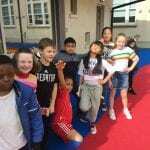 Lots of classes came to our fashion show! 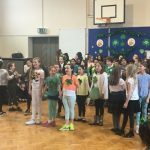 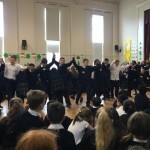 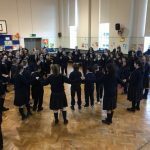 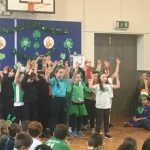 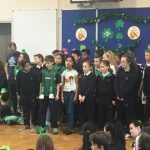 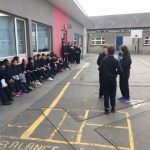 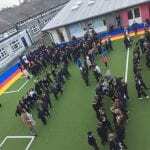 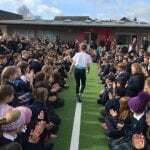 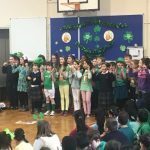 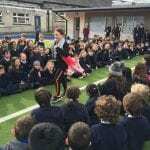 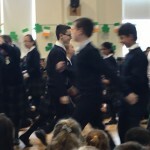 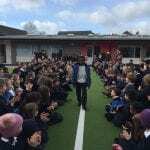 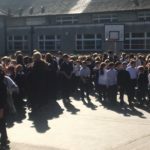 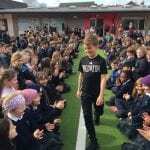 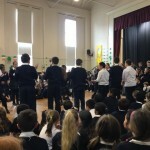 All of the pupils and teachers got together to celebrate Irish dancing during Seachtain na Gaeilge! 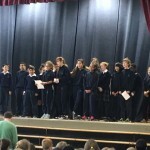 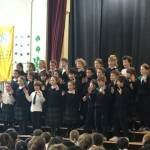 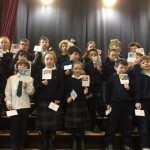 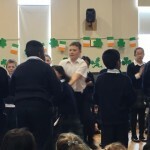 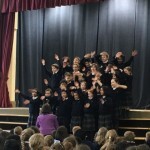 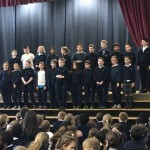 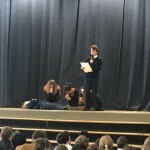 The boys and girls wrote their own Gaeilge dramas this week and performed them for the rest of the class. 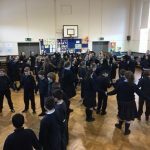 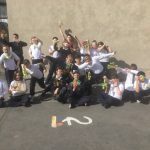 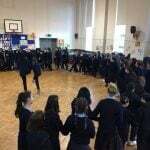 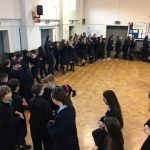 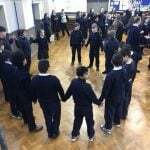 The pupils in 4th year in St. Louis High School came to Halla Cullen this week to teach the 5th class pupils some Irish dancing. 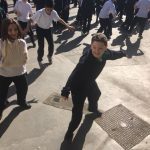 It as great to learn a new dance. 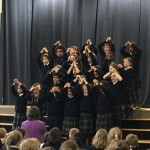 Thanks to the girls and teachers for coming from St. Louis High School to teach us. 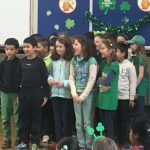 We were working hard to create these St. Partick’s Day crafts in Room 15. 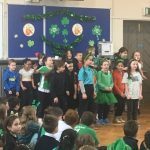 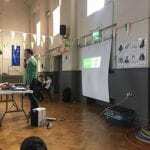 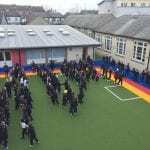 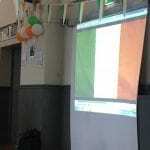 All of the pupils in St. Louis were celebrating Seachtain na Gaeilge with lots of different activities. 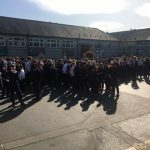 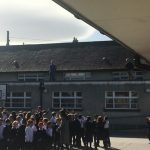 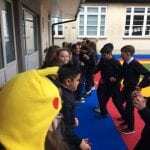 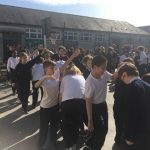 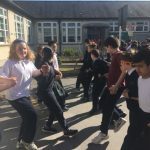 Everybody joined Mr. Mc Garrigle for a céilí in the yard. 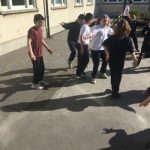 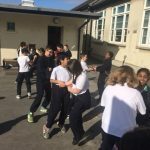 It was great to learn some new Irish dances together in the lovely sunshine. 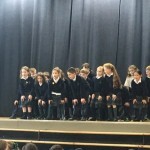 We went to the Halla then and got to see all the performances from the different classes. 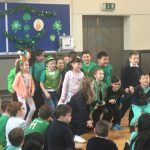 We learned lots of new words in Irish. 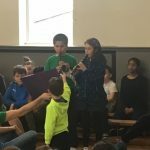 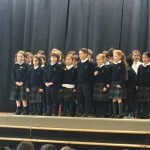 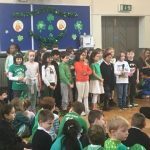 Celebrating seachtain na gaeilge by performing a song and a poem. 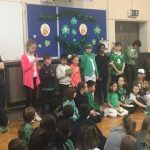 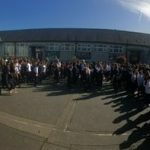 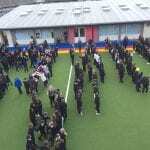 All of the pupils gathered in Halla Cullen to celebrate Seachtain na Gaeilge. 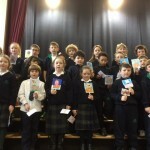 All of the pupils have been working very hard with learning and using new Gaeilge phrases. 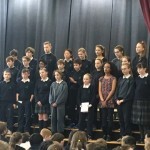 It has been great to her them around the school. 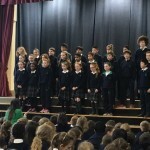 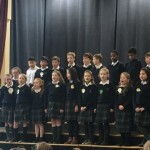 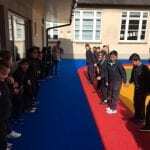 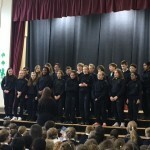 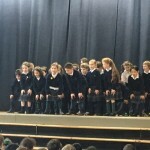 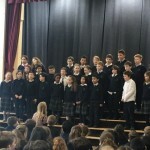 Each class prepared a piece to perform ‘as Gaeilge’ in Halla Cullen. 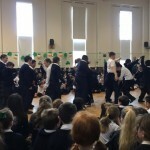 We heard poems and songs and we saw lovely dances. 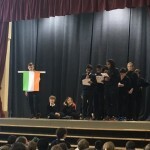 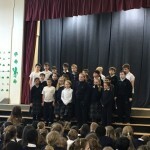 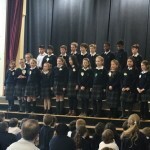 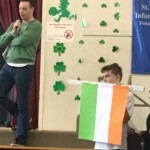 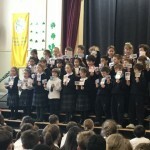 6th class also told us a story and poem about Irish history. 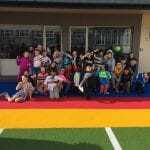 It was a really super day! 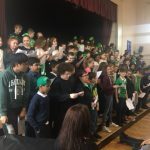 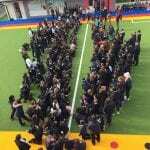 Well done to everybody involved!